ou may not realize it, but you can change almost every aspect of Excel's menus. Typical Excel users get by just fine with the standard menus. Because you're reading this book, however, you're probably not the typical Excel user. 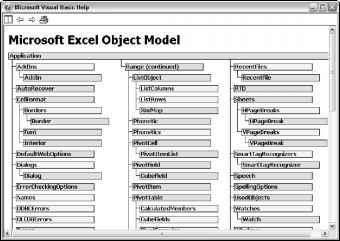 In this chapter I describe how to make changes to the Excel menu system. Most of the Excel applications you develop get along just fine with the standard menu system. In some cases, however, you may want to add a new menu to make it easier to run your VBA macros. In other cases, you may want to remove some menu items to prevent users from accessing certain features. If these sorts of changes seem useful, you should read this chapter. Otherwise, you can safely skip it until the need arises.